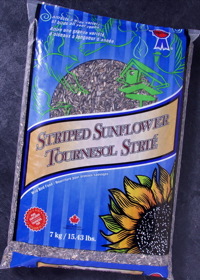 Topcrop brand striped sunflower is the ideal choice for attracting a full range of wild birds to your feeder. Striped sunflower is preferred by birds over many other seeds. This is a premium product so there is less waste at your feeder, plus you will attract more desirable birds, such as Blue Jays, Cardinals, Nuthatches, Chickadees, Grosbeaks, Tufted Titmouse, and American Goldfinch. This product is intended for feeding wild birds. Not for human consumption, or feeding to domestic birds.